Since graduating from the Landing School of Boatbuilding and Design in 1986, I have been fortunate to work for a number of very well known boatbuilders. Some of these builders include Bertram, Davis Yachts, Carver, Pro-Line and Sport-Craft. I have also had the pleasure of working for the well known designer Jay Benford at Benford Design Group. Each of these experiences have taught me a great deal and I try to keep all the successes as well as the few failures in mind while working on each new design. I have worked in all phases of design on boats ranging from a 15' outboard to an 80' steel motor yacht. My experience includes styling, hull design, stability calculations, structural design, machinery arrangements, interior arrangements, electrical schematics and joinery detailing. At Sport-Craft I was responsible for a number of departments including Tooling, Quality Control and Lamination. Needless to say, I have received a very well rounded education in boat design and construction over the years. 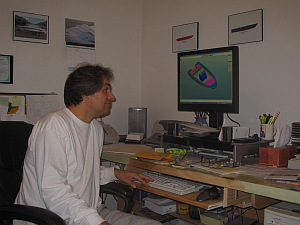 Since starting Smith Marine Design, I have worked on a variety of projects. These have been for both production builders as well as custom projects. You can find out more about these projects in The Hold. I use Ashlar-Vellum Graphite and Argon CAD software to create my designs, along with a large number of spreadsheets that I have written for calculating everything from the volume of baitwells to prop sizes to full weight and trim studies. While these tools are used to aid in designing the boat, they are no substitute for over 25 years of experience! I live with my wife Arlene and son Logan in Citrus County on Florida's Gulf Coast. My staff at Smith Marine Design is pictured at left. 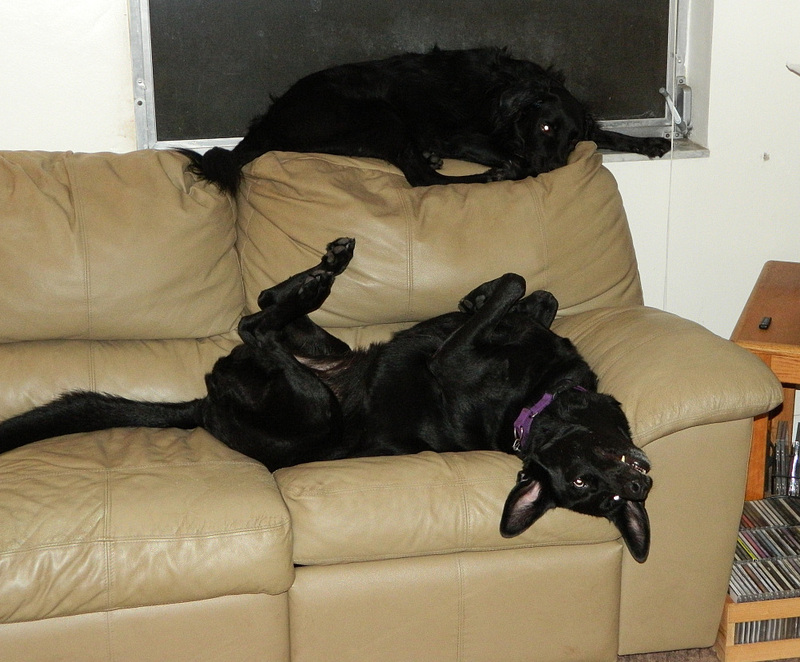 Niki the German Shepherd is VP of Security while Mogley, the Flat Coated Retriever, is currently security officer in training. (Yes, that is a 65 pound dog laying on the windowsill.) Don't let this photo taken during break time fool you, we take security very seriously here! Citrus County is a quiet area with beautiful lakes, rivers and the Gulf of Mexico. It's an ideal area for small boats as there is always a stretch of sheltered water. On weekends I like to be out on the water fishing, although you may also find me peddling my bike down the Withlacoochee Trail. In 2010 I was diagnosed with Multiple Myeloma, a cancer of the plasma cells in the bone marrow. While this cancer is currently incurable, with treatment it can be sent into remission for relatively long periods of time. As I write this in October 2014, I am in remission after a stem cell transplant in May 2014. While I can no longer accept contracts from new clients for custom or production boats, I am still designing stock plans. I am also still supporting my builders, so unless you are going to take ten years to build your boat, I should be around to help! The cancer may have slowed me down, but I still have some boats left in me!